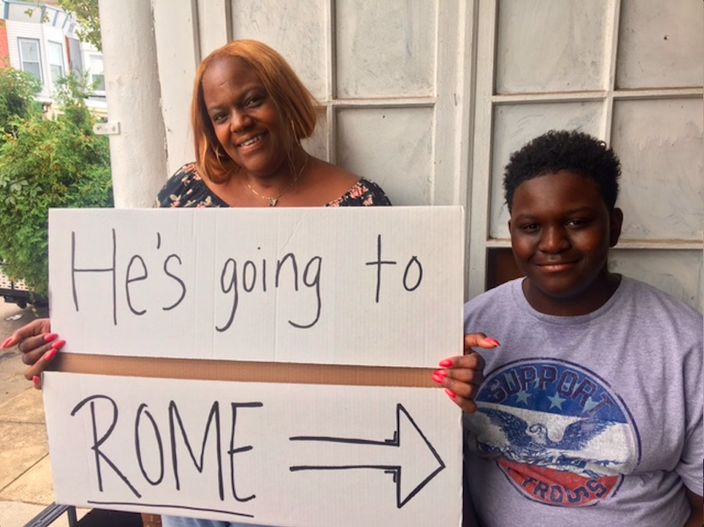 Kareem Bah is heading to Rome this weekend thanks to an outpouring of online support after his mother, Tonya Crawford-Bah, posted flyers in their Southwest Philadelphia neighborhood seeking help. Donors also responded through a crowdfunding appeal. 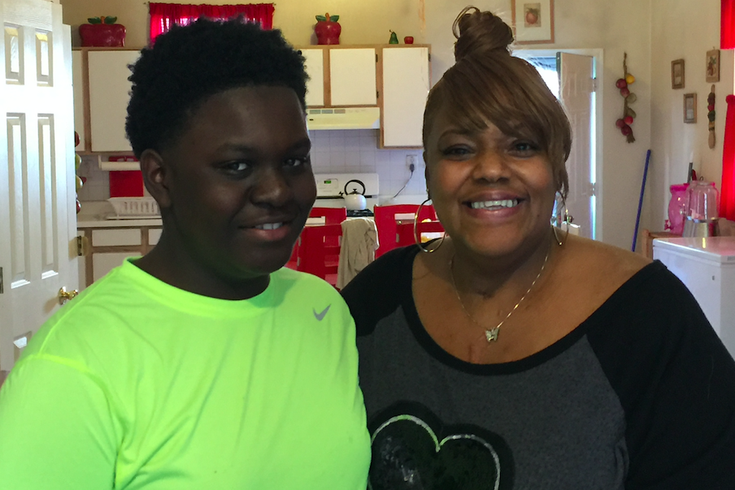 On Easter Sunday afternoon, Mohammed "Kareem" Bah will head over to the Southwest Philadelphia charter school where he's an eighth grader, board a bus and embark on a dream made possible by the kindness of strangers. Shortly thereafter, he'll board a flight for Europe with a group of 17 fellow students and chaperones for an eight-day trip that will take him to various stops in Italy, Greece and Germany. The highlight, of course, will be Rome. He's making the class trip because his academic prowess, along with his mother's passionate pleas for help, tapped into the positive side of social media. "It feels great," Kareem, 14, said Friday in the living room of his family's Ludlow Street home. Last May, Tonya Crawford-Bah started putting out flyers in Southwest Philadelphia. Their purpose: o help raise money so her son could travel to Rome, Greece and the Vatican. Kareem’s “high academic performance and eagerness to learn” led to a National Latin Exam on which he got just one question wrong. Those results garnered an invitation for a trip that the Boys Latin of Philadelphia Charter School student's family couldn’t afford, which led his sister Kiana to post a GoFundMe campaign. Three months later, a Villanova University student named Jasmine Mays saw one of the flyers and posted it on social media. Soon, thanks to shares on Facebook, Twitter and other sites, donations from strangers started pouring in. More than $5,000 was raised. Kareem is a shy, soft-spoken young man. But you can sense the joy that being able to travel to Europe – something his mother was never able to do – brings him. Sitting in the living room with his mother and an uncle, Ronald Crawford, the teen spoke about how the donations helped him not only cover the cost of the trip, but buy a suitcase, clothing and other travel necessities that at one time felt impossible. Most of his classmates didn't hear about the social media or flyer appeal. That could be because his mother didn't post them near his school, only in their neighborhood. Though donations were slow to begin, the appeal started spreading. And when the tally topped $4,000, he knew he was taking that trip. Kareem is measured with his words, but his mother is not. "I am so excited for him," she said, noting that neighbors Chris and Janine, who travel often, gave Kareem a raincoat, a wallet with a bunch of Euros in it and a waterproof camera so he can take a whole lot of pictures. "It's a dream come true. "I've never been anywhere before. I've kind of lived in a bubble," she said. "For my son to be able to take this trip, it just blows my mind. Just sitting here thinking about it, I still can't believe it. We never would have been able to afford it otherwise." A chance encounter at the Fresh Grocer near their home around Thanksgiving brought her to tears. That's where she ran into Mays, the college student whose post started the social media avalanche. "We were hugging and crying right there in the store," Crawford-Bah recalled with a laugh. "I'm sure people were looking at us trying to figure out what was going on." For her part, Mays said this week that she's "so incredibly happy" to have been able to help Kareem get this "wonderful opportunity." She also recalled that supermarket encounter. "The weirdest feeling had come over me as I looked at him and I felt like I had known him," she recalled. "I approached both mother and son and introduced myself and his mother was so happy to have met me and I couldn't believe that fate had brought us to meet one another in person. "I believe that people are put in the right place at the right time to meet people who are meant to supplement their lives," Mays said. "I feel extremely fortunate to have such a minor role in the life that Kareem will live." Now an eighth grader, Kareem plans to take many photos on his European trip and post as many as he can on the GoFundMe page – so the 197 people who donated can join him from afar on the trip they made possible. "Human goodness. This is about people being good and just wanting to see Kareem get to Rome," said Crawford, noting that it's also a cultural reflection in certain ways. "With young black men, there are so many negative stories out there, but this is a story about academic excellence being rewarded." Crawford thought back to a story told by his own mentor, who graduated with a law degree about the same time his brother was released from prison. The mentor was met with a college shrug while his brother garnered a block party. "Sometimes in our culture, it's not all that cool to be smart," he said. "Well, this is cool." Kareem is most looking forward to seeing architecture on his trip, not to mention the Roman Forum, Circus Maximus and the Colosseum. He didn't even let it get him down too much when we checked next week's weather in Rome and saw a forecast for rain on several days. "I just want to thank everybody who helped me very, very much," he said.